The Dutch West India Company occupied northeastern Brazil for 30 years, from 1624 to 1654. The first 10 years of occupation financially strained the Company, despite considerable profits made from sugar, Brazil-wood, and occasional loot swiped from Iberian ships. In 1636, Johann Maurits arrived to govern, tasked with stabilizing the settlement. Under his leadership (which lasted until 1644), the colony thrived. Among the 46 artists and scholars Maurits hired as his research staff to promote scientific studies in Brazil were physician Willem Piso and astronomer Georg Markgraf, who arrived in 1638. The Historia naturalis Brasiliae, their collaborative illustrated folio volume, in twelve books, was published in 1648. Rich in description of native life, the book contains 446 remarkable woodcuts illustrating local flora and fauna. 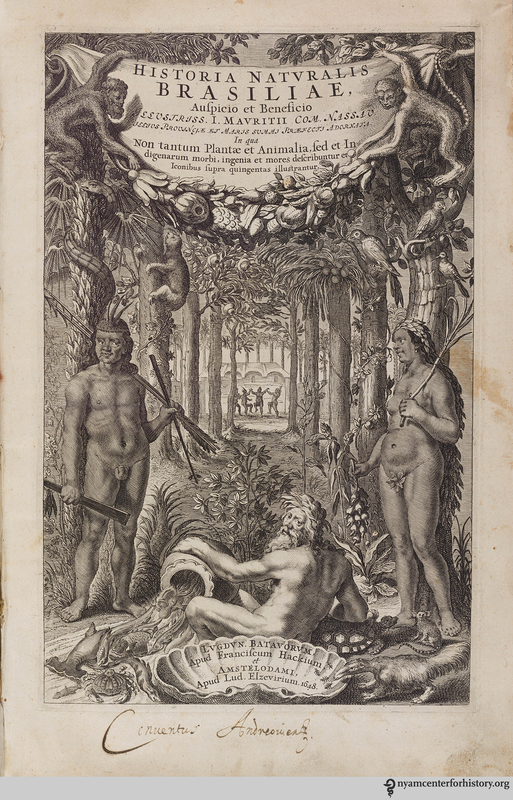 It comprises the most important early documentation of zoology, botany, and medicine in Brazil. The woodcuts are based on an original collection of paintings and sketches, now lost; many of these original depictions were likely done by Markgraf himself. The lushly illustrated and very beautiful frontispiece features a European traveler, presumably Dutch, reclining before two natives in a verdant green wood, teeming with wildlife. Even in black and white, the exuberant foliage coupled with the beautiful natives may remind the modern viewer of the Caribbean paintings of Paul Gaugin. Title page of Historia naturalis Brasiliae, 1648. Click to enlarge. Piso wrote the first four books, which deal mainly with diseases native to Brazil and their remedies. The physician, assigned as Maurits’ personal doctor, turns his clinical eye to the ways of the native populations, from whom he makes several important discoveries. He offers a vivid account of a patient in the throes of tetanus, and suggests that the root cause of the ailment may be a minor wound, of the kind that craftspeople incur while working. Georg Markgraf wrote the remaining eight books, subtitled Historia rerum naturalium Brasiliae and mostly devoted to natural history. The books’ topics range from medical uses of plants; to fish, birds, insects, quadrupeds and reptiles; and to full descriptions of geographic regions and their inhabitants. Images from two of these books, dealing with quadrupeds and with insects, are pictured here. Markgraf describes the appearance, habits, and environment of each animal depicted. Some of the four-legged creatures pictured have names we still use today: the armadillo, on page 231, would be recognizable as such to a child, as would a short-legged jaguar, on page 235. In other cases, it’s more difficult to link the textual description with the images—the placement of the woodcuts doesn’t always correspond with the text. Is, for example, the shaggy llama on page 244 the Peruvian sheep referenced in the text? Markgraf points out that the creature pictured has a two-toed foot on his back legs, just as a llama does. Click on an image to enlarge and view the gallery. ArmadilloHistoria naturalis Brasiliae, 1648, page 231. Short-legged jaguar. Historia naturalis Brasiliae, 1648, page 235. Llama or Peruvian sheep? Historia naturalis Brasiliae, 1648, page 244. Of note in the insects section is the smiling spider on the bottom of 243, his belly almost entirely silver in color, and his mottled brown and black legs described in the text as weaving an exceedingly elegant web. 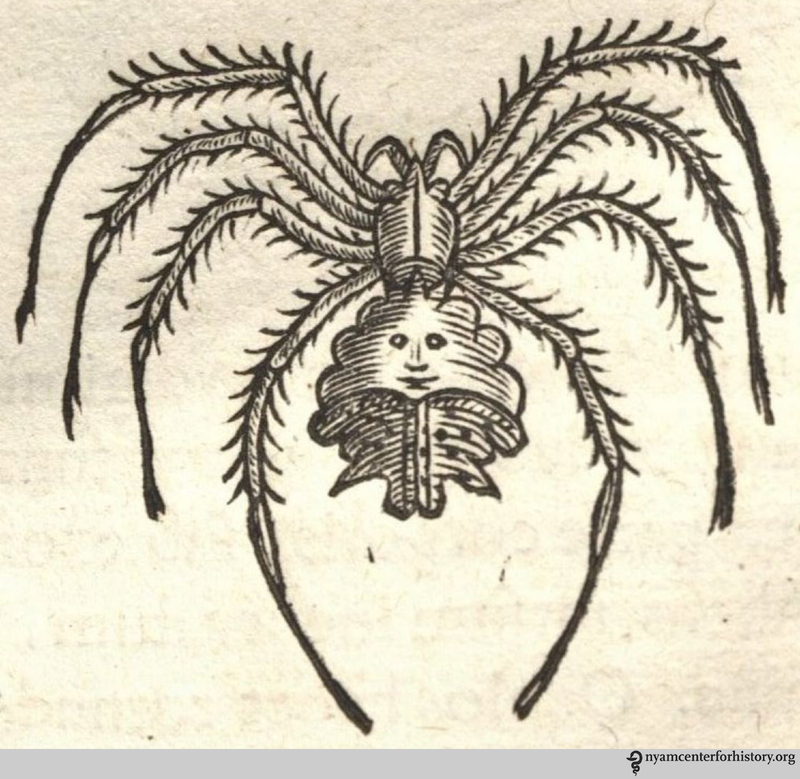 Spider on page 248 of Historia naturalis Brasiliae, 1648. Click to enlarge. This entry was posted in Collections, History of medicine and tagged Brazil, Georg Markgraf, Historia naturalis Brasiliae, Historia rerum naturalium, natural history, Willem Piso by nyamhistorymed. Bookmark the permalink.